Looking for movie tickets? Enter your location to see which movie theaters are playing Slaughter on Tenth Avenue / Edge of the City near you. Waterfront Noir Double Feature: New 35mm Print! 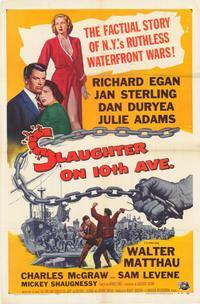 SLAUGHTER ON TENTH AVENUE, 1956, 103 min. An upstart district attorney (Richard Egan) tries to crack the New York waterfront’s mob-enforced code of silence and mete out justice for a murdered whistleblower. [35mm] <br /><br /> EDGE OF THE CITY, 1957, 85 min. Another gritty exploration of life on the Manhattan docks that’s also a powerful look at 1950s race relations. Sidney Poitier and John Cassavetes play working-class pals driven apart by ignorance and racism (exemplified by a virulent thug, played brilliantly by Jack Warden).